(CNN) -- Four-time defending champion Rafael Nadal slid to an astonishing 6-2 6-7 6-4 7-6 defeat to Sweden's Robin Soderling at the French Open on Sunday. 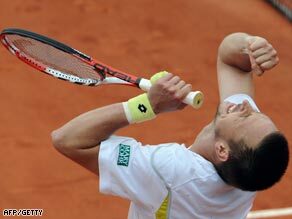 Soderling savors his unlikely triumph against Nadal in the French Open fourth round. Soderling, the 23rd seed, was a rank outsider against the world number one who had never lost a match on the clay at Roland Garros and was a short-priced favorite to win a record fifth straight title. But Soderling never looked back after breezing through the first set of their fourth round match and closed out victory as Nadal sent a volley wide after bravely saving a matchpoint in the fourth set tiebreak. The Spaniard tried to look on the positives after his shock defeat. "It had to happen one day, and this is an excellent season for me. "Of course it's a bit sad, but I have to overcome this as quickly as possible. No one remembers defeats on the long run. People remember victories. So I have to move forward and try and prepare the best I can." King of clay Nadal had compiled a 31-match winning streak at the French Open and was attempting to win the second grand slam of the year after beating world number two Roger Federer in the final of the Australian Open. Soderling took advantage of a strong serve and big forehands to give Nadal a torrid time in front of a stunned crowd on the Philippe Chatrier court. Defeat for Nadal opens up his side of the draw with world number three Andy Murray a possible beneficiary. Murray, who was seeded to meet Nadal in the semifinals, beat Marin Cilic of Croatia 7-5 7-6 6-1 in their earlier fourth round match. He will play Fernando Gonzalez of Chile for a place in the semifinals. Gonzalez beat Victor Hanescu of Romania 6-2 6-4 6-2 in their fourth round match. Soderling will next play Nikolay Davydenko of Russia as the 10th seed beat eighth-ranked Fernando Verdasco of Spain 6-2 6-2 6-4.in the final last 16 match of a dramatic day.